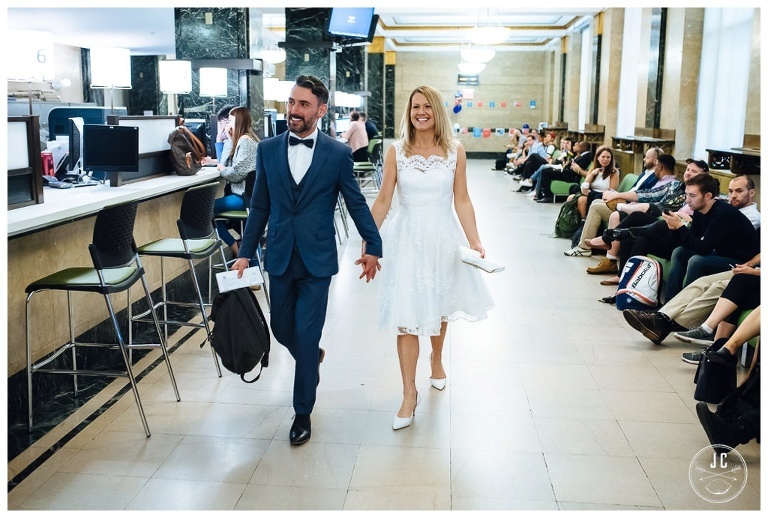 Joanna and James had a magical matrimony at the New York City Hall Elopement on September 28th, with an intimate ceremony held at the Manhattan Marriage Bureau. These two met at work—both of them work at Marks and Spencer—when they signed on to a training course together. After getting to know each other, they spent a weekend in Brighton for their first date, walking on the beach, riding the Ferris wheel, eating Thai food and attending a comedy club for some stand-up laughs. They finished out the night at a club called Bohemia. A year later, to the day, the two of them were in Santorini on a clifftop terrace drinking wine together when James pulled out a ring! They still describe it as the most amazing place they have ever been, and after going there myself last year I have to agree! In fact, May and I might have enjoyed wine on the very same terrace while Lincoln was enjoying the scenery. 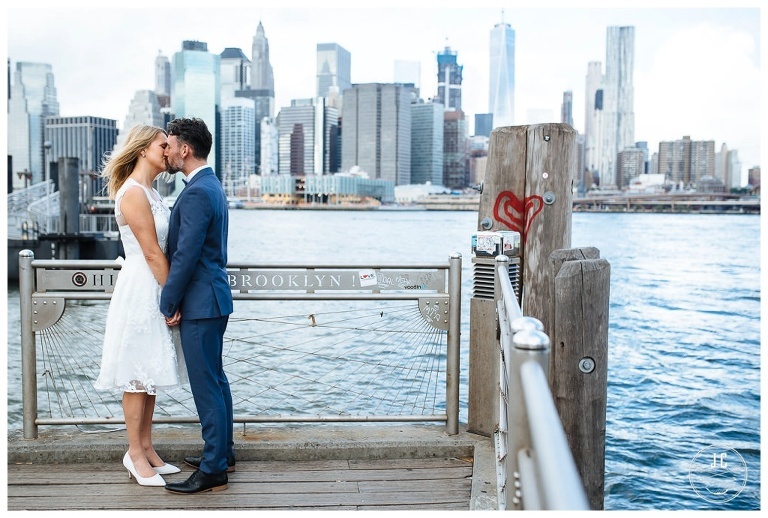 The two of them have always considered New York to be their dream location, which is why they wanted to get married here. They are big Les Mis fans and wanted to catch a show while they were here before they flew out to Hawaii and then Vegas. They both love to travel—they went to Rome last year—and would have loved to keep globe-hopping if they could. 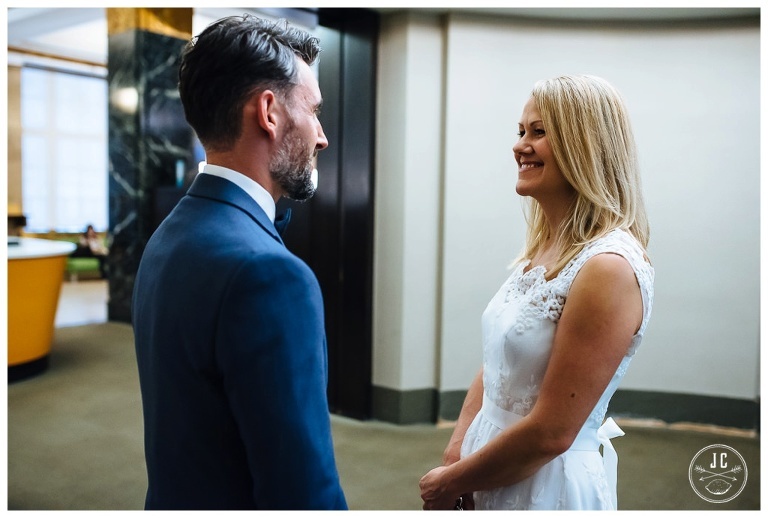 Because Joanna and James are romantics at heart, they wanted something simple for their day, which is why they decided to have a NYC Elopement. After the ceremony, we headed out on the town to capture some photographs of the two of them in the setting that was so important to them, before they headed off on their new adventures. James & Joanna, thank you for allowing me to be part of your elopement! I loved exploring New York City with you and wish you both the best.